Yesterday I shared 5 tips to help you navigate Thanksgiving Day. Today, let’s dive into what being in your eating experience looks like in practice. 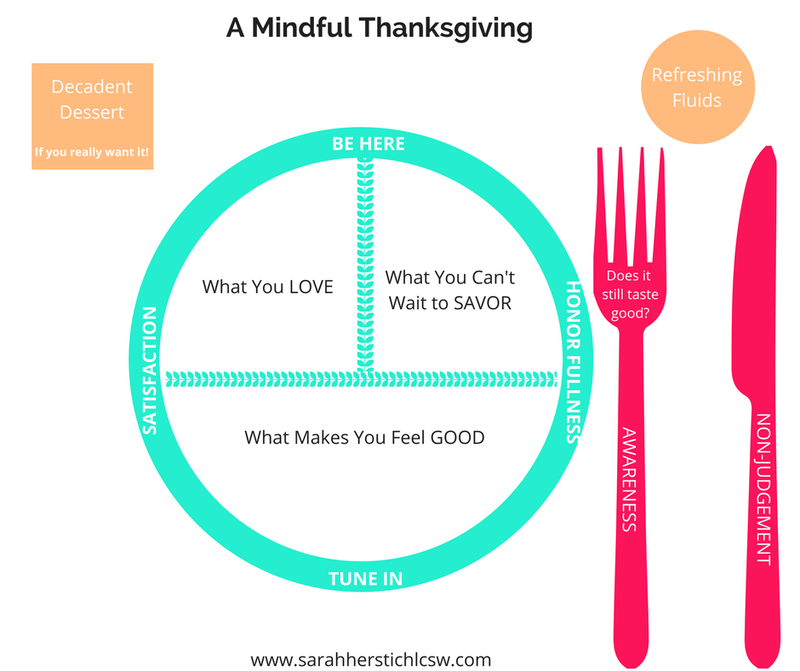 There are lots of components to eating mindfully. Around the holidays there’s article after article published about eating mindfully, allowing indulgence, and following your body’s cues. But where do you start? How do you put it into practice? Be here. Be in your eating experience. While you’re seated at the table and physically feeding yourself, focus on what you're doing, how you're feeling, what you're feeling and the many senses you've engaged as you eat. When you’re talking and cheers-ing, put down your fork and shift to that experience. You can always come back to eating- there's no need to do everything at once. Tune in. Are you hungry? Are you satisfied? Are you full? Are you stuffed? Tuning into your body’s natural cues can be your guide when to continue eating or when it’s time to put the fork down and call it a day. Satisfaction. Eat what will satisfy you- this includes fun foods and nutritious foods. We know that only eating a plate of mashed potatoes and gravy probably won't make us feel too hot, so focus on what makes you physically feel good, enjoy every bite of what you love and bask in the party happening in your mouth as you experience what you’ve been dying to savor. Awareness is key. This goes hand in hand with being here and tuning in. When you’re in your eating experience you can begin to differentiate when something tastes REALLY good and when something is just MEH! If it doesn’t taste really good, keep it moving.. on to the next! Non-judgement prevents you from beating yourself up and getting caught in the diet → binge → rinse and repeat cycle. Regardless of what you eat or how much, if you can shift to a place of non-judgement about the experience, guilt and shame will be taken off of the table… which means you’ll be less likely to engage in old, all too well known patterns. Enjoy dessert if you really want it! Some people live for dessert over the holidays. If dessert is your ride or die, take all of these components and apply them as you enjoy the pumpkin pie, pecan cheesecake or whatever you jam is. If it’s not a “hell yes I want that!” maybe it’s a “no thanks” or even "I'll take a small slice to start." If you want it, eat it. Eat it mindfully and with intention to enjoy the hell out of it. If it's not all that you've been dreaming of, give yourself permission to taste and call it a day. Don’t forget about hydration. Does alcohol filleth thy cup 🍸 ? Be sure to hydrate your body with refreshing fluids. Remember, your body can mistake hunger for thirst, so be sure to prioritize something other than your favorite spirit. Although Thanksgiving has become a day for overindulgence and many times a built in day to get your eat on, I want to encourage you to take a macro view. Zoom way out to see your entire day. Yes, the appetizers and food will be aplenty, but what else will be going on? What is really important to you on this particular Holiday? How do you want to feel before, during and after your day? Get clear on that, and see if you can create that experience for yourself. Remember, the foods most of us will be celebrating with tomorrow are abundantly available to you each and every day of the year. It's the feelings, the spirit, the celebration, the connection with family and friends that you may be missing throughout the year. You can't head to Wegmans or Trader Joe's and fill your cart with those things. So, indulge in them. Experience their goodness. Fill yourself up with those feelings. Be present. Be mindful. Be aware of how you feel. Give yourself permission to do things differently this year. Be in your experience and do the very best you can with what you have. Thanks for subscribing! To get you started I just sent you my guide to self-love. Head on over to your inbox to check it out.